WK understands that the holidays can be tough for some in our community, and our associates are always enthusiastic about helping out. In December, the firm collected and donated items to benefit clients of True North, the Voluntary Action Center, and Great Circle as part of our commitment to serving our communities. WK “adopted” families through True North, an organization that works to prevent domestic violence and create a safer community, and the Voluntary Action Center, which provides financial assistance with basic and emergency needs to low-income individuals in Boone County. 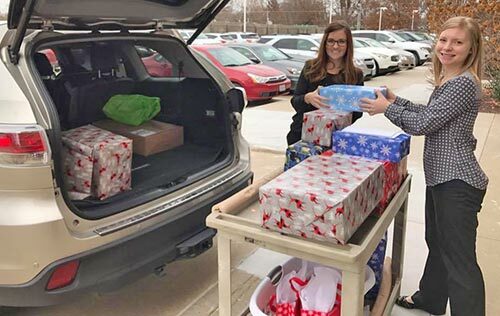 Through these adoptions, WK members and associates bought and wrapped Christmas gifts for children in need, groceries for families, and anything else that the families requested such as household items and cleaning supplies. WK associates also purchased games and toys as cottage gifts for Great Circle, an organization that provides temporary housing for children and behavioral health services to children, individuals, and families. The gifts will be shared by current Great Circle residents and kids that come to stay in the future. WK looks forward to another year of serving its community and helping those in need in 2017, and we thank our clients for helping us carry out that vision. FIVE QUESTIONS WITH…ASHLEY DODSON, CPA. Get to know Ashley Dodson, CPA, whose favorite thing about WK is the people she gets to work with and work for.